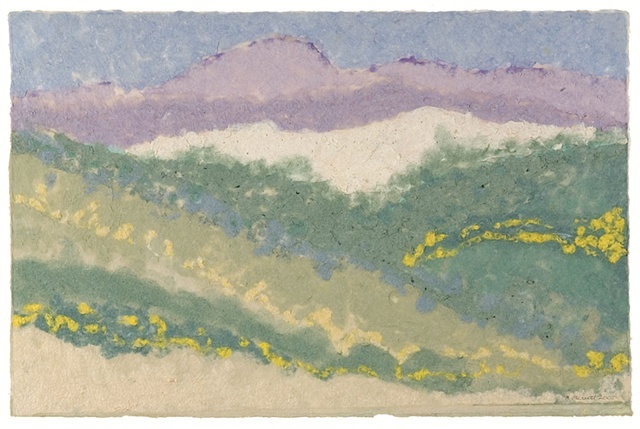 This paper painting of a mountain hillside was one of many study pieces for a larger tryptich, Soaring, a collaboration with lithographer Anita Dillman, now in the permanent collection at the Dartmouth-Hitchcock Norris Cotton Cancer Center. The "paint" for this artwork consists of a slurry of pigmented plant fibers and water: the papermaker's pulp. To form the design, I applied colored pulps of two Asian fibers, gampi and kozo to wet base sheet to make the design.